Learn how to connect to an ODBC Driver from Google Apps Script and configure the SQL Broker, and get sample scripting for processing the data in a Google Spreadsheet. Google Apps Script gives you the ability to create custom functionality within Google Sheets, Google Docs, and more. With the CData SQL Broker, you can create a MySQL interface for any ODBC driver, including the 90+ ODBC drivers by CData. The MySQL protocol is natively supported through the JDBC service in Google Apps Script, so by utilizing the SQL Broker, you gain access to ODBC data within your Google documents. This article discusses connecting to an ODBC Driver from Google Apps Script, walking through the process of configuring the SQL Broker and providing sample scripting for processing the data in a Google Spreadsheet. Our script only executes a SELECT to read data from a specified table, but you can easily extend it to execute an INSERT, UPDATE, or DELETE. With SQL Broker, your local ODBC data sources can look and behave like a standard MySQL database. Simply create a new MySQL remoting service in SQL Broker for the ODBC driver and ensure that the SQL Broker is installed on a Web-facing machine (or can connect to a hosted SSH server). The MySQL Remoting feature of the SQL Broker enables you to access an ODBC data source as a virtual MySQL database. The SQL Broker runs a service process that listens for MySQL requests from clients. 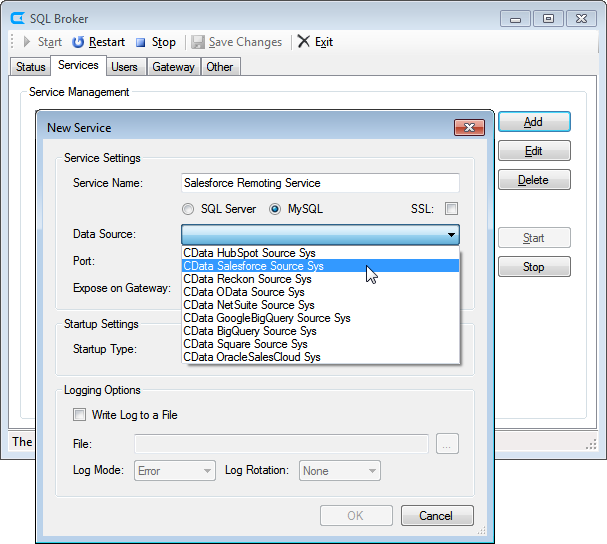 The service can be configured in the SQL Broker UI. At this point, you have configured the SQL Broker for your ODBC driver. All that is left now is to use Google Apps Script to access the SQL Broker and work with your ODBC data source in Google Sheets. In this section, you will create a script (with a menu option to call the script) to populate a spreadsheet with your data. We have created a sample script and explained the different parts. You can view the raw script at the end of the article. Create a handful of class variables that are available for any functions created in the script. This function adds a menu option to your Google Sheet, allowing you to use the UI to call your function. This function is used to find the first empty row in a spreadsheet. * @return The row number of the first empty row. The function below writes the data using the Google Apps Script JDBC functionality to connect to the MySQL remoting service, SELECT data, and populate a spreadsheet. When the script is run, two input boxes appear. It is worth noting that while the function is designed to be used as a menu option, it could be extended for use as a formula in a spreadsheet. * Reads data from a specified ODBC 'table' and writes it to the specified sheet. When the function is completed, you have a spreadsheet populated with data from your ODBC driver and you can now leverage all of the calculating, graphing, and charting functionality of Google Sheets anywhere you have access to the Internet. * Reads data from a specified 'table' and writes it to the specified sheet.